After an accident, many people are left shaken and unsure of how they will pay their medical bills and replace lost wages that they need. If you were injured in an accident caused by someone else, you may be able to recover compensation. 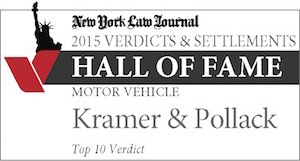 At Kramer & Pollack, LLP, our experienced Bronx personal injury lawyers possess more than 30 years of experience handling these claims. We represent people throughout the five boroughs of New York City. In order to recover compensation in a personal injury lawsuit, you must be able to establish both liability and damages. You will need to show that the defendant owed you a duty of reasonable care, a breach of the duty, causation, and damages. In other words, there must be a causal relationship between the defendant's breach of the duty to use reasonable care and the harm that you suffered. The value of the case is expressed in terms of money. Many factors go into determining damages in a personal injury lawsuit, including how serious the injuries are, how the victim's life has changed since being injured, how permanent the injuries are, and the age of the injured person. The injuries sustained in a car accident can change your life. They can include traumatic brain injuries, broken bones, amputated limbs, nerve damage, and paralysis. New York is a no-fault state, which means that after a car accident, you must first turn to your own insurer for medical coverage and wage reimbursement. In order to sue a driver who was at fault, you will need to meet a no-fault threshold and show that you have a serious injury as defined by the law. You should be aware that insurers make profits by limiting how much money they pay on claims, regardless of the severity of a plaintiff's injuries. They may try to take a recorded statement or obtain a written statement. It is important to not to give recorded or written statements before calling an experienced personal injury attorney in the Bronx or surrounding areas. We can help you take the necessary steps to preserve your rights. If you are injured on someone else's property, you may be able to hold the property owner accountable to the extent that their negligence led to your injury. After a trip and fall accident, damages may be recovered by bringing a premises liability lawsuit. You will need to show that the property owner either created the dangerous condition that caused you to fall, or that they failed to make repairs or failed to warn of the dangerous condition. In order to hold the property owner liable, you will need to establish actual or constructive notice. Constructive notice is usually proven by showing that the dangerous condition that caused your fall existed long enough that a prudent property owner would have noticed it. New York has some special laws that apply to certain kinds of personal injury claims that arise out of construction accidents. Generally, an injured worker can recover workers' compensation benefits through their employer. In addition, they may be able to obtain damages from a third-party contractor, subcontractor, or owner for dangerous conditions that resulted in an injury. Also, under special laws like New York Labor Law Section 240, there are protections for construction workers who work at an elevation. They are supposed to be given appropriate scaffolding and safety equipment to prevent injuries. Our Bronx personal injury attorneys can hold owners and contractors responsible when construction workers suffer gravity-related injuries as a result of the defendant's failure to provide the proper safety devices. The defendant cannot raise the defense that the injured construction worker was negligent under Section 240. Section 241 provides that certain actions must be carried out on a job site, and specific equipment must be given to workers in the interests of safety. If the actions or equipment are neglected by the people in charge, the worker can hold them responsible for any resulting injuries. Burn injuries can be catastrophic and life-changing. There are many medical issues that may need to be addressed in connection with burns. These include scars, infections, grafting, debridement, range of motion, and pain management. Often, there is psychological trauma associated with burn injuries. It may be necessary to conduct a timely investigation of the reason for the burns. Insurers may try to limit damages even when burns caused by their insured resulted in serious scarring and disfigurement. It may be necessary to retain experts not only on issues of liability but also on the extent of the damages. For example, we may need to retain an expert to establish whether future revision surgery will be necessary to minimize scarring. In some cases, burns have placed accident victims on advanced life support and ventilators, which are costly. When you go to the doctor, you assume that the doctor will treat you competently, as will the nurses in charge of you. Unfortunately, health care providers sometimes make mistakes. Our Bronx personal injury lawyers can evaluate a medical malpractice claim to determine whether it meets the criteria to bring a lawsuit. A patient and their attorney must show that there was a doctor-patient relationship that gave rise to a professional duty of care, and there was a breach of the professional duty of care. The specific duty will depend on the specialty in which the defendant practices. We have experience handling medical malpractice lawsuits involving failures to diagnose, surgical errors, birth injuries, and failures to treat infections, among other issues. 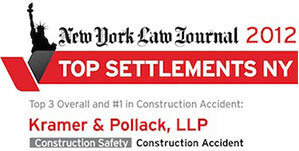 Personal injury lawsuits are often challenging. Insurers are more likely to bargain fairly if you have an aggressive and experienced attorney representing you in your claim. 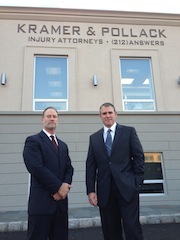 At Kramer & Pollack, our attorneys have a reputation for our staunch dedication to preparation. We are successful because insurers know that we are ready to go to trial to make sure that our clients obtain the recovery to which they are entitled. Other attorneys and former clients recommend new clients to us. We handle lawsuits throughout New York City, including in the Bronx, Queens, Brooklyn, and Manhattan, as well as in Nassau and Suffolk Counties. Call us at 212-ANSWERS or use our online form to set up a free consultation with a personal injury lawyer in the Bronx or beyond. Every time I needed to talk to him, he was able to. I already have recommended him to friends and will continue to do so. Larry is a great guy and a very good person. When my daughter Jesse thinks about all the bad times in her accident, the only good was Larry. He is a lifetime friend to our family, no holds barred. He held us together and did anything and everything for us. Larry always made me feel that he was interested in me personally, and not interested simply in my case. That effort, combined with a keen understanding of the law and of the inner workings of the civil court system, allows me to recommend Larry without reservation to anyone needing legal representation.